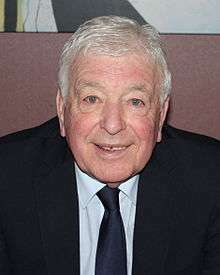 Ian Robert Callaghan MBE (born 10 April 1942, Toxteth, Liverpool) is a retired English footballer who holds the record for most appearances for Liverpool. 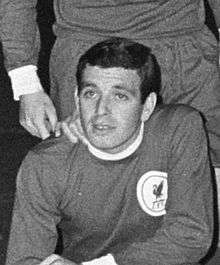 Callaghan with Liverpool in 1966. Callaghan played 857 times for Liverpool. He was booked only once, in the 1978 League Cup Final replay at Old Trafford, which Liverpool lost to Brian Clough's Nottingham Forest. Callaghan also played 4 times for England. Although he was in the squad for the 1966 FIFA World Cup, he did not play in the final and so did not receive a medal. Following a Football Association-led campaign to persuade FIFA to award medals to all the winners’ squad members, Callaghan was presented with his medal by Prime Minister Gordon Brown at a ceremony at 10 Downing Street on 10 June 2009. 1 2 "Appearances". Liverpool F.C. Retrieved 27 August 2012. ↑ "A timeline for Liverpool Football Club - LFChistory - Stats galore for Liverpool FC!". Retrieved 30 June 2015. ↑ "Ian Callaghan". England Football Online. Retrieved 24 November 2016. ↑ "BBC SPORT - Football - World Cup 1966 winners honoured". Retrieved 30 June 2015. ↑ "League table for the 1963-1964 season - LFChistory - Stats galore for Liverpool FC!". Retrieved 30 June 2015. ↑ "League table for the 1965-1966 season - LFChistory - Stats galore for Liverpool FC!". Retrieved 30 June 2015. ↑ "League table for the 1972-1973 season - LFChistory - Stats galore for Liverpool FC!". Retrieved 30 June 2015. ↑ "League table for the 1975-1976 season - LFChistory - Stats galore for Liverpool FC!". Retrieved 30 June 2015. ↑ "League table for the 1976-1977 season - LFChistory - Stats galore for Liverpool FC!". Retrieved 30 June 2015. ↑ "League table for the 1961-1962 season - LFChistory - Stats galore for Liverpool FC!". Retrieved 30 June 2015. ↑ "Matchdetails from Liverpool - Leeds United played on 1 May 1965 - LFChistory - Stats galore for Liverpool FC!". Retrieved 30 June 2015. ↑ "Matchdetails from Liverpool - Newcastle United played on 4 May 1974 - LFChistory - Stats galore for Liverpool FC!". Retrieved 30 June 2015. ↑ "Matchdetails from Everton - Liverpool played on 13 August 1966 - LFChistory - Stats galore for Liverpool FC!". Retrieved 30 June 2015. ↑ "Matchdetails from Liverpool - Leeds United played on 10 August 1974 - LFChistory - Stats galore for Liverpool FC!". Retrieved 30 June 2015. ↑ "Matchdetails from Liverpool - Southampton played on 14 August 1976 - LFChistory - Stats galore for Liverpool FC!". Retrieved 30 June 2015. ↑ "Matchdetails from Liverpool - Manchester United played on 13 August 1977 - LFChistory - Stats galore for Liverpool FC!". Retrieved 30 June 2015. ↑ "Matchdetails from Liverpool - Borussia Moenchengladbach played on 25 May 1977 - LFChistory - Stats galore for Liverpool FC!". Retrieved 30 June 2015. ↑ "Matchdetails from Liverpool - Bruges played on 10 May 1978 - LFChistory - Stats galore for Liverpool FC!". Retrieved 30 June 2015. ↑ "Matchdetails from Liverpool - Borussia Moenchengladbach played on 10 May 1973 - LFChistory - Stats galore for Liverpool FC!". Retrieved 30 June 2015. ↑ "Matchdetails from Borussia Moenchengladbach - Liverpool played on 23 May 1973 - LFChistory - Stats galore for Liverpool FC!". Retrieved 30 June 2015. ↑ "Matchdetails from Liverpool - Bruges played on 28 April 1976 - LFChistory - Stats galore for Liverpool FC!". Retrieved 30 June 2015. ↑ "Matchdetails from Bruges - Liverpool played on 19 May 1976 - LFChistory - Stats galore for Liverpool FC!". Retrieved 30 June 2015. ↑ "Matchdetails from Hamburg SV - Liverpool played on 22 November 1977 - LFChistory - Stats galore for Liverpool FC!". Retrieved 30 June 2015. ↑ "Matchdetails from Liverpool - Hamburg SV played on 6 December 1977 - LFChistory - Stats galore for Liverpool FC!". Retrieved 30 June 2015. ↑ "Liverpool career stats for Ian Callaghan - LFChistory - Stats galore for Liverpool FC!". Retrieved 30 June 2015. Wikimedia Commons has media related to Ian Callaghan.